Son Tho commune authority and villagers experience several climate change hazards, including cold spells and droughts, and some rainfalls. Severe and increased droughts bring numerous adverse impacts to people and ecosystems. Forest protection and enrichment are effective drought buffers and the most promising EbA measure based on consultations & a vulnerability assessment. This solution includes activities in the top, middle and low parts of the hilly terrestrial ecosystems. This solution is strongly linked with the EbA Solution “Strategic mainstreaming of Ecosystem-based Adaptation (EbA) into planning frameworks in Ha Tinh and Quang Binh Province” and builds on its vulnerability assessment as a technical response, covering community involvement, technical trainings and field implementation. Natural forests in the area are increasingly converted to short-rotation plantation, mainly Acacia hybrid (hereafter acacia) for wood chip production. This conversion leads to degradation of ecosystems with run off and erosion, reduction of services such as water resources and non-timber forest products. Weather variability exacerbates this reduction that makes adaptive capacity of local residents and ecosystems worse. In particular, severe and increased droughts brings numerous adverse impacts to people and ecosystems, which are: i) Rice growers could not cultivate the second rice crop in the lower part of the spot due to the water shortage; ii) Fruit trees and annual crops in the middle part of the spot (orange, peanut, maize, green bean, cassava, etc) did not grow well and many died; iii) Shortage of water for human use (people often use ground water from wells and surface water from streams in the forest directly); iv) Many lands are left as fallow during droughts. 70 households managing 65 ha of natural degraded forests directly benefit from measures. Other residents nearby and about 100 ha of inland ecosystems also benefit indirectly. The solution has different blocks which are connected to each other. Planting native timber (BB1) on the mountain top to provide underground water that offers moisture to the lower part provides water to humans and paddy rice fields, and protects all lower parts from strong wind. Planting pineapples and pinto peanut (BB2) between orange fields next to the top retains moisture, controls runoff and erosion, and improves soils. Making compost from agricultural residue (BB3) provides organic fertilizer for orange trees and crops. Farmers have stable income from forest goods and services that support them to tackle climate change impacts. Thus, they better adaptation capacity from well-managed forests (reduction of number of water scarcity days; goods and services provided by healthier ecosystems). Mr. Nguyen Thanh Hao moved up to the commune when he was a toddler. There are 5 people in his family, including a 95-year old father, his wife, 2 secondary school children, and him. He has 4 ha of forests, half of which accounts for acacia plantation, 2 ha of orange trees that bring the main income to his family, 0.2 ha of annual crops including sugar cane, paddy rice and maize. Livestock includes 2 cows, 1 calf, 30 chicken and 10 bee hives. He experiences that a large area of natural poor forest is converted to short-term plantations, mainly with acacia for pulpwood. Acacia growers can get an income in 5-6-year rotation with this fast growing species, requiring only a small investment. However, this conversion leads to many negative impacts to the ecosystems. Land is exposed to heat on hot days and severe run-off during the rains, so the top soil layer is degraded after each rotation, causing floods to become more extreme. No other plants could grow under acacia canopy due to density. Short rotation leads to poor underground water resources. As a result, water for human daily needs and crops in lower parts of the area is reduced in terms of quantity and quality. Mr. Hao and other households had to shift from 2 paddy rice crops per year to 1 paddy rice and 1 maize or cassava due to water shortages. This problem is exacerbated by unpredictable weather conditions. 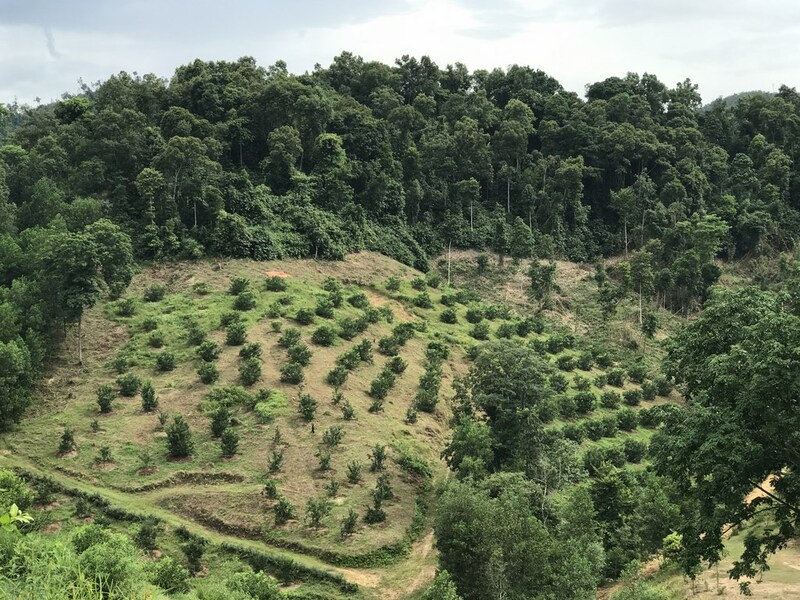 The GIZ project provided him with native timber seedlings to add into his natural forests in the top, orange trees in the middle, pineapples and pinto peanut between the orange fields, bee hives, and compost. Mr. Hao and other members understood that they should keep the existing natural forests rather than clear cut for acacia, for a number of benefits, including provisioning services - firewood, sprout, grass for animals, water for humans and crops; and regulating services - underground water, micro climate, habitat for other plants under the canopy. While he has to invest more time for his orange fields, the added plants reduce erosion, keep moisture and improve soils. His family clearly confirms that, planting native timber is not for his generation, but for the future, even the far future, they would be happy to protect the ecosystems for his other crops, for nearby families and for the ecosystems themselves. They enjoy seeing birds and beautiful flowers around, and agree that they are doing the right thing.